The Mpindo pack had been resident at our Rehabilitation Facility since end of June this year following an urgent call to to extract the pack which had denned in a communal land. We only released the pack into wild 2 weeks ago. We released the pack into the safety of the protected Hwange National Park at the Jambili pan and since then we have them being monitored by our trackers to see how they fare. The Mpindo pack is finding their way in the park. 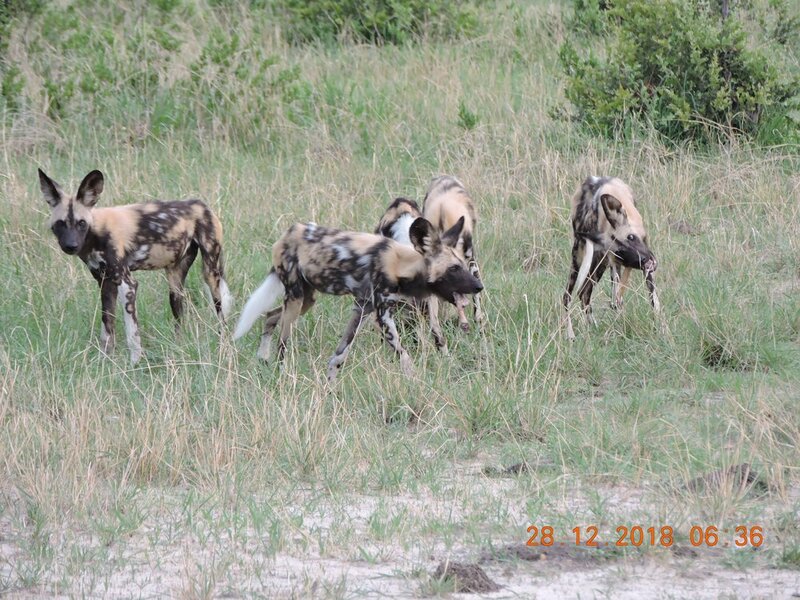 On the 21 December 2018 our tracker, Washington Moyo, who is keeping tabs on the pack had a wonderful sighting of the pack on the main road to Main Camp near Dom loop. He reported the following day that the pack had killed a Kudu. So much for adapting quickly to their new home. This morning Washington brought back some pictures below from his tracking trip. The pack just killed an impala at the Dom pan near Main Camp again. The pack is doing great. We wish Jonathan, Snow-Tail and their pups well as they get comfortable in their new home in the wild where they belong.